Lasagna recipes that are sure to please the pickiest of eaters! Served with a salad and warm crusty bread, lasagna is the quintessential pasta dish and comfort food. 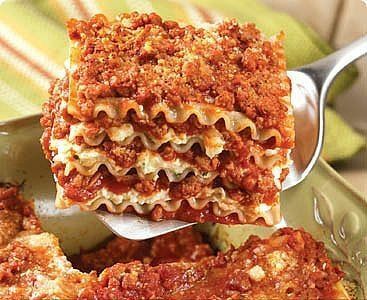 Unique lasagna recipes that are sure to please everyone are provided for your individual preference. Picky eaters are sure to be pleased with at least one of the featured lasagna recipes that include Beef and Sausage Lasagna, Spinach Lasagna, White Lasagna, Vegetable Lasagna, and Salmon Lasagna. Enjoy one of these easy to make lasagna recipes or a ready-made lasagna for a tasty dinner tonight! 1. In a 4 qt. saucepan, cook sausage meat, ground beef, and onion over high heat, stirring frequently, until meat is well browned and onion is tender, stirring to break up sausage with spoon. Spoon off fat if any. 2. Add tomatoes with their juice, tomato paste, salt, and sugar to saucepan; heat to boiling. Reduce heat to low; cover and simmer 30 minutes, stirring occasionally. 3. Meanwhile, in large sauce pot, prepare lasagna noodles in boiling water as label directs, but do not use salt in water; drain. In bowl, mix ricotta, egg, and parsley. 4. Preheat oven to 375 F. In a 13" by 9" glass baking dish, arrange half of lasagna noodles; top with all of the ricotta mixture. Sprinkle with half of mozzarella; top with half of meat sauce. Layer with remaining noodles and meat sauce; top with remaining mozzarella. 5. 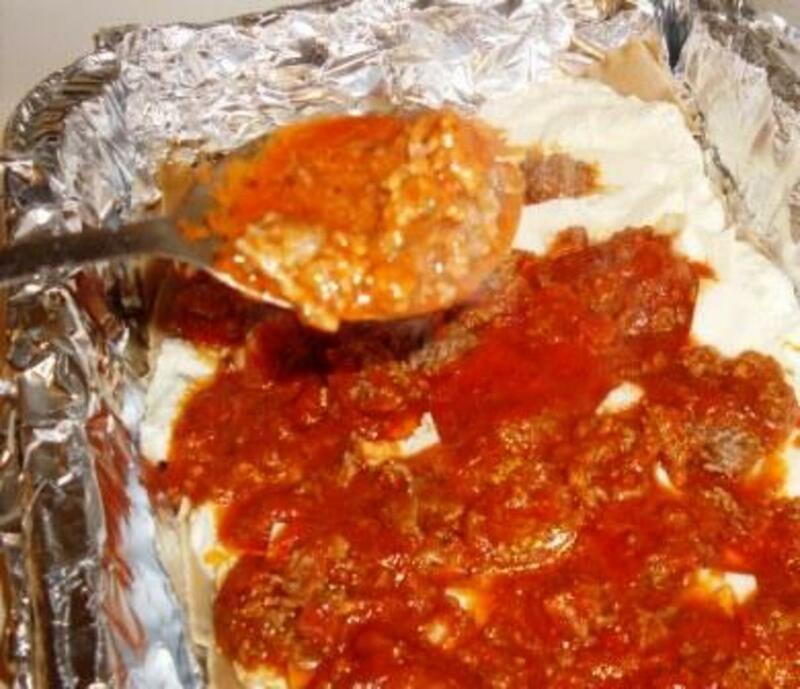 Cover lasagna with foil and bake 30 minutes. Remove foil and bake 15 minutes longer or until lasagna is not and bubbly and top is lightly browned. Add a side of Whole Green Beans and a delicious Tiramisu Cake and you've got the perfect meal. Straightforward, well-organized lasagna recipes are divided into easy-to-follow numbered steps (most fewer than 10), guiding even the amateur through a hearty one-dish meal. 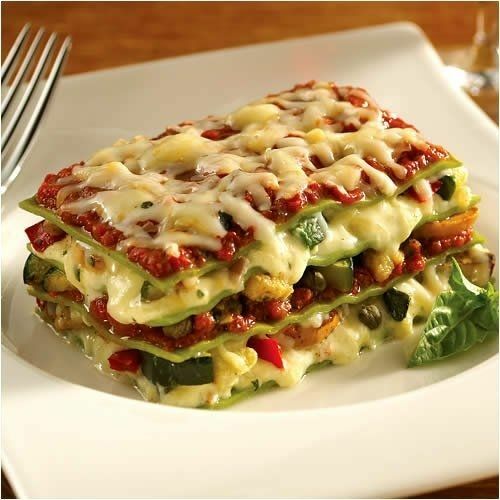 The Classic Lasagnas chapter includes just what it promises with crowd-pleasing selections such as Lasagna Bolognese and Vegetarian Lasagna. While the New Flavors chapter showcases creative gems (Asparagus, Goat Cheese, and Lemon Lasagna, and Lobster Lasagna with Roasted Red Pepper Sauce), international flavor–inspired dishes such as Chinese Pork and Scallion Lasagna, and Middle Eastern Lasagna, and a surprising Breakfast Lasagna feel like a bit of a stretch, trying to cover all flavor bases. 1. In large sauce pot, prepare lasagna noodles in boiling salted water as label direct; drain. 3. In a medium bowl, mix ricotta, Parmesan, nutmeg, eggs, and 1/2 teaspoon salt; set aside. 4. In a 3 quart saucepan, heat the remaining 1 tablespoon of olive oil over medium high heat until hot. Add flour and cook 1 minute. Gradually stir in milk, white pepper, and 1/4 teaspoon salt and cook, stirring constantly, until sauce boils and thickens slightly. Remove saucepan from the heat. 5. Preheat oven to 375 F. In a 13" by 9" glass baking dish, arrange one-third of the lasagna noodles, overlapping to fit. Spread half of the ricotta mixture over the noodles. Drain off liquid from spinach if any; spoon half of the spinach over the ricotta mixture; then top with one third of the sauce. Repeat layering. Top with remaining noodles, then remaining sauce. 6. Bake lasagna, covered, 40 minutes or until hot and bubbly. 1. In a nonstick 12 inch skillet, melt 1 tablespoon margarine or butter over medium heat. Add zucchini, broccoli, oregano, and 1/4 teaspoon salt and cook, stirring frequently, until vegetables are tender-crisp, about 5 minutes. Add spinach and toss until wilted. Remove skillet from heat. 2. In medium bowl, mix ricotta and eggs; set aside. 3. In a large sauce pot, prepare lasagna noodles in boiling salted water as label directs. Drain. 4. Meanwhile, preheat oven to 350F. In a 2 quart saucepan, melt remaining 3 tablespoons margarine or butter over medium heat. Stir in flour and 1/4 teaspoon salt until smooth. Gradually stir in milk; cook, stirring constantly, until sauce boils and thickens. Remove saucepan from heat; stir in parmesan. 5. In a 13" by 9" glass baking dish, layer half of the lasagna noodles, half of the ricotta mixture, half of the vegetable mixture, and half of mozzarella. Top with half of white sauce, then with the remaining noodles, ricotta, and vegetable mixture. Spoon remaining sauce over vegetable layer; arrange remaining mozzarella on top. 6. Bake lasagna 40 to 45 minutes or until hot and bubbly. 1. In a 3 quart saucepan, melt margarine or butter over medium heat. Stir in flour and nutmeg until blended; cook 1 minute. Gradually stir in milk; cook, stirring constantly, until sauce boils and thickens. Remove saucepan from heat. 2. In a small bowl, mix ricotta, Parmesan, parsley, and eggs. 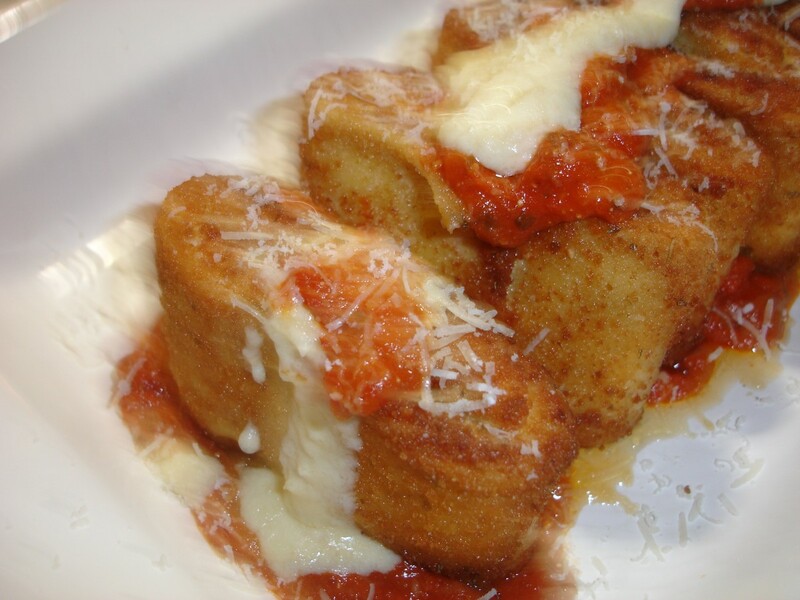 In a large bowl, combine mozzarella and Fontina. 3. Preheat oven to 375 F. In a 13" by 9" ceramic or glass baking dish, evenly spoon 1 cup of white sauce. Arrange one third of the lasagna noodles over the sauce, overlapping to fit. Spoon half of the ricotta mixture over the noodles; spread with 1 cups sauce; top with half of the remaining noodles. Place half of the shredded cheese over the noodles, then sprinkle with sun dried tomatoes and spread with 1 cup of sauce. Arrange remaining noodles over sauce; top with remaining ricotta mixture, remaining sauce, and remaining shredded cheese. 4. Cover baking dish with foil and bake 25 minutes. Remove the foil and bake 15 5o 20 minutes longer or until the lasagna is hot and bubbly and the top is lightly browned. 1. In a 2 quart saucepan, heat vegetable oil over medium heat until hot; stir in flour; cook 1 minute. 2. Gradually stir milk into flour mixture, stirring constantly, until mixture boils and thickens. Stir in Parmesan and pepper; set white sauce aside. 3. In medium bow, mix creamed spinach with mozzarella and ricotta. 4. Preheat oven to 375 F. Spread 1/4 cup white sauce to cover bottom of 13" by 9" glass baking dish. Arrange one-third of no-boil lasagna noodles over sauce, overlapping to fit. Spoon half of ricotta mixture over noodles; top with half of salmon. Repeat layering once. Top with remaining lasagna noodles and remaining sauce. 5. 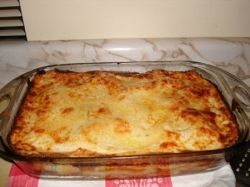 Cover baking dish with foil and bake lasagna 40 minutes. Remove foil and bake 10 to 15 minutes longer or until lasagna is hot and bubbly and top is lightly browned. Sprinkle with chopped tomato to serve. You'll love the succulent shrimp and creamy Alfredo sauce on a bed of tender Fettuccine noodles topped with freshly grated Parmesan cheese. 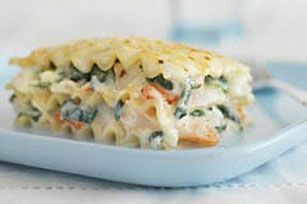 Best of all, this delicious creation of seafood lasagna is quick and easy! Meal serves 2. Separate the mushroom stems from the caps and discard the stems. Slice the caps 1/4-inch thick. Heat 2 tablespoons of oil and 2 tablespoons of the butter in a large (12-inch) sauté pan. When the butter melts, add half the mushrooms, sprinkle with salt, and cook over medium heat for about 5 minutes, until the mushrooms are tender and they release some of their juices. If they become too dry, add a little more oil. Toss occasionally to make sure the mushrooms cook evenly. Repeat with the remaining mushrooms and set all the mushrooms aside. To assemble the mushroom lasagna, spread some of the sauce in the bottom of an 8 by 12 by 2-inch baking dish. Arrange a layer of noodles on top, then more sauce, then 1/3 of the mushrooms, and 1/4 cup grated Parmesan. Repeat 2 more times, layering noodles, sauce, mushrooms, and Parmesan. Top with a final layer of noodles and sauce, and sprinkle with the remaining Parmesan. 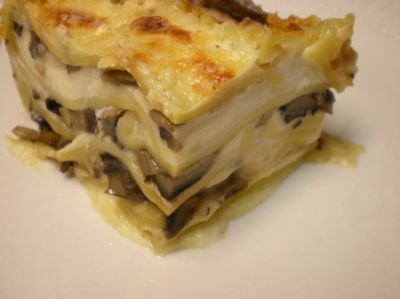 Bake the mushroom lasagna for 45 minutes, or until the top is browned the sauce is bubbly and hot. Allow to sit at room temperature for 15 minutes and serve hot. The Trio Lasagna Pan from Chicago Metallic has 3 separate channels allowing cooks to be creative and makes it easy to serve vegetarians or carnivores from one pan. A custom-fit, exclusive spatula is deep enough to get that great first piece with no mess. The width and length of each channel is the same as standard lasagna noodles, making lasagna building fast and easy. This lasagna trio pan be used to make three dinners in one batch - tonight's dinner and two for future nights or for those unexpected guests. Like Any of these Lasagna Recipes? - Which One? Oh so yummy. Your lasagna pictures make me feel like garfield the cat. I just want to hop into the pan and eat. That spinach lasagna is calling my name. Hello! Now I can answer the question: What's for dinner? Thanks for these great recipes. Appreciated! I love lasagna. All these recipes sound delicious. They all look so delicious. I love lasagna. 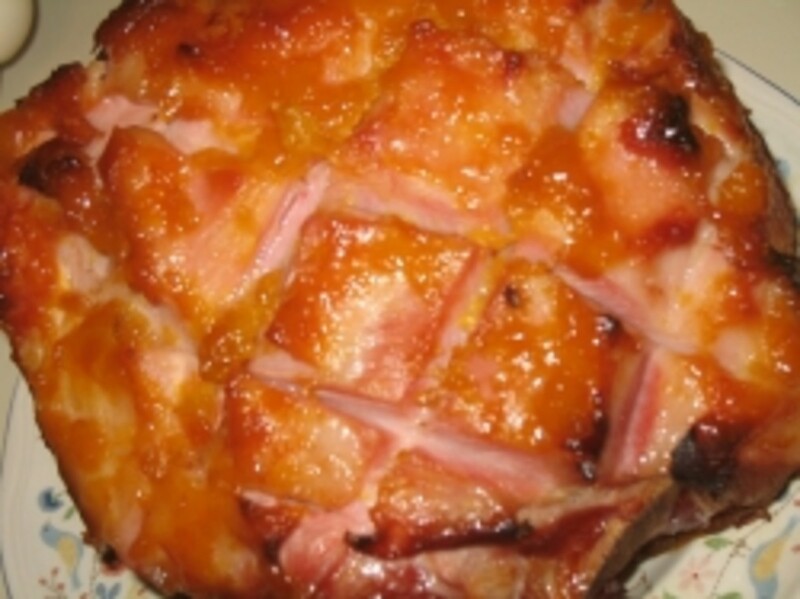 Thank you for sharing these recipes. Adding spinach to the red (meat) sauce has been a great hit with my kids - thanks for all the other great options! Mmmmm....seafood lasagna, never thought of that! 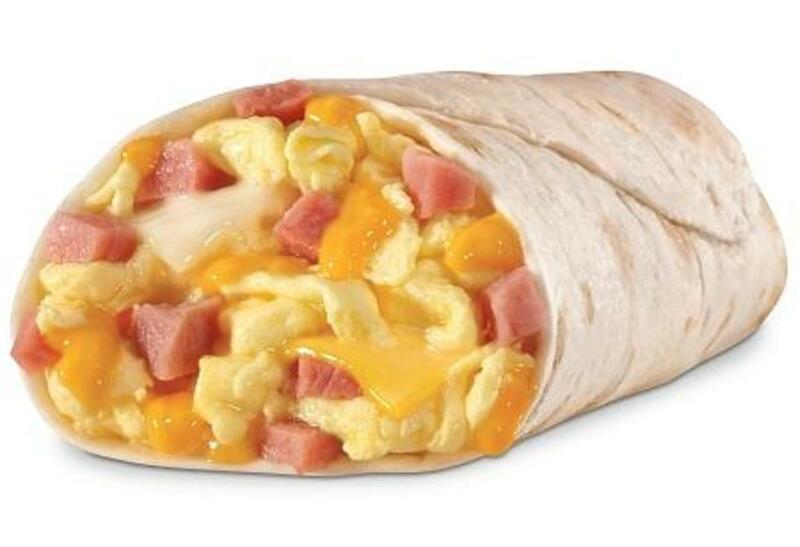 I want to eat it right now. Luscious lens. Lasagna is one of my favorites. I will take them all. For those of you die hard meat fans (like me) that cringe at the thought of putting spinach in your lasagna you have to at least try it once. My first shot was spinach in a deep dish pizza. The slightly bitter taste of the spinach actually goes very well with red sauce and meat. I was thinking about spinach lasagna for tonight's supper, but now you've got me thinking about salmon lasagna! I've never even considered that! I'm going to have to give that a try some time. Thanks for this page. I love Lasagna but have never tried making it, looks simple enough but might need practice. Wonderful! Blessed from the Squid Angel April Fools Tour Bus. Mmmmmmmmm ... lots of vegetarian choices. I'd be happy with any or all of them. I'm really excited about the three-channel lasagna pan. Beautifully done, as always! This is a good page. Some interesting recipes! But you lost me a little with Chef Boyardee! Of course, in a pinch, even the Chef will do! Thanks! You've out done yourself with this lens!! Good work! NOW I am hungry! Now this is What I Call A Delicious Lens!! My Mother used to make a Killer Lasagna and I am Learning how to make the way she used to. I used to look forward to my Father's Birthday or their Anniversary, that's when Mom would make her Special Lasagna baked with Love and Full Taste in every bite!! Thanks for sharing this and helping remember one of the joys I shared with my Mother!! I'm always looking for new recipes for hubby's favorite foods. He will especially love the mushroom and seafood lasagna. I have seen the trio lasagna pan and it would be a fabulous gift. Thanks for your tasty recipes! These are amazing. My family loves lasagna. 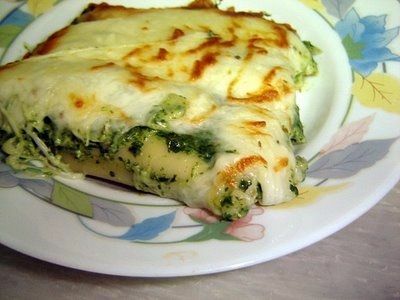 I need to try your Spinach and Vegetable Lasagna Recipes. They look and sound outstanding. Thanks for sharing these. Lasagna is my favorite dish! Love it anyway it is made. Red sauce or white sauce make me no never mind. I think it must be the combination of noodles (pasta) and cheese that does it for me. Blessed! Love Lasagna. All the recipees sound fantastico. The mushroom lasagna sounds appetizing enough to try. Ok, the mushroom lasgna and the spinach lasagna will be on our menu sometime in the next couple of weeks. Thanks for the recipes! I love Lasagna, you have proven you can do anything with it. I especially like the Vegetarian recipes. Looking at those photos of lasagna made me sad. I haven't had lasagna in years. The spinach and the salmon lasagnas look like something I can go Garfield about. My Gosh, they sound like pure lasagna heaven. Very tasty lens. My husband and I have an ongoing competition in the kitchen. I'll beat him on the next round. Yum... thanks for including vegetarians! I especially love white lasagna. Welcome to Culinary Favorites From A to Z.